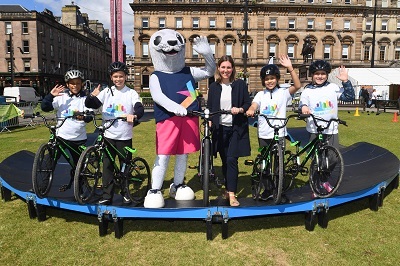 Excited pupils from some of our city's primary schools headed to a sunny George Square today, set on enjoying an array of activities and exhibits to mark Clean Air Day. Glasgow is gearing up for its biggest ever Street Play weekend with 24 communities taking part in the traffic-free event, which runs from Friday, June 22 to Sunday, June 24. Glasgow's Lord Provost Eva Bolander departs for Bethlehem to lead a professional twinning visit. After being homeless on-and-off since a teenager, Derek Bradford, (34), can finally see light at the end of the tunnel after accepting help to quit drugs. A new city centre hub is being created to help Glasgow's homeless. Glasgow today remembered those who suffered in the Great Famine and the enduring contribution of refugees and their descendants to the city's culture and character, at the unveiling of an Irish and Highland Famine Memorial. Council secures £940k funding award for innovative solar car park. Glasgow is forging a path towards cleaner air, as timescales for Scotland's first Low Emission Zone, were today agreed by councillors at the City Administration Committee. British Sign language (BSL) users, their families and interested parties are invited to share their views on how Glasgow City Council and partners can make their services more accessible. Glasgow's Lord Provost with the council's latest car gifted to the city by an anonymous donor today Tuesday 5 June 2018. The Home Office has responded to a Glasgow City Council motion in favour of safer drug consumption facility by highlighting the health benefits of safer injecting. Glasgow City Council has launched plans for an exciting event in George Square to promote a national day dedicated to improving air quality. Glasgow, which will become the first Scottish city to introduce a Low Emission Zone (LEZ) by the end of the year, is supporting Clean Air Day which will take place on Thursday June 21 2018. Glasgow's Depute Lord Provost, Councillor Philip Braat joined senior military personnel in George Square to witness the Armed Forces Day Flag being flown from the City Chambers.